Over 30 years ago, I met Mitra, a beautiful young woman from Iran. We became friends quickly and we’ve experienced so much of life together ever since. The beautiful thing about the Persian community is the timeless culture they have preserved away from their Iranian homeland. From an age-old language, Farsi, to enduring traditions, like their Persian New Year called “Nowruz”, and of course, the distinct aromatic flavors that make Persian cuisine one of the best in the world. I admire it all and I have loved experiencing this world through the eyes of Mitra and all of my beautiful Persian friends. The combination of eggplant, tomatoes, chicken, and a unique blend of spices, makes this dish so uniquely delicious that, like me, you may want to make it again and again. In my home, I have two picky eaters by the names of Isabella and Ignacia. Isabella is my youngest of three, and Ignacia is my exchange student from Chile. They would both agree that the idea of eating anything with eggplant makes them want to run for the hills. However, there is an exception to every rule and Eggplant Khoresh is that exception. I’m about to confess here so humor me. I recently made Mitra’s Eggplant Khoresht and didn’t tell the girls what was in the dish. Because it’s a stew, the ingredients tend to cook together enough to make the eggplant a bit more unrecognizable once sliced and spooned onto a plate. After one bite, they both loved it! It wasn’t until they were halfway through devouring this mouthwatering dish that Ignacia inquired about the unfamiliar vegetable on her plate. The surprised look on both of their faces – once they realized that eggplant is quite delicious – was priceless. Although Persian cuisine includes an endless selection of unforgettable dishes, Mitra’s Eggplant Khoresht is at the top of my list of favorites. If you’ve never tried your hand at making Persian food before, this is an excellent place to start. The good news is, it doesn’t take a culinary degree to accomplish this exotic dish. And, just like the distinct beauty of the Persian culture that has a rich history to share with the world, this genre of food will broaden your pallet, introduce you to new flavors, and create a delightfully memorable experience that your entire family will enjoy. 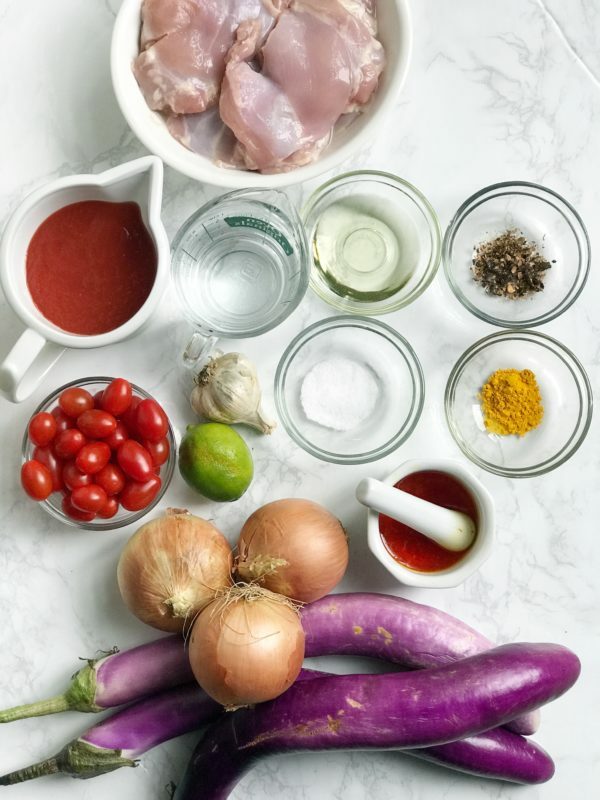 A traditional Persian eggplant stew packed with a ton of flavor and made with tender chicken and zesty tomatoes. Serve with Basmati Rice and Lavash bread for dipping into the sauce. Preheat oven to 350° F. Prepare all ingredients ahead of time. Peel eggplants and slice lengthwise 1/2-inch thick. Place eggplant in a colander and sprinkle both sides with salt to remove the bitter taste. Set aside for 20 minutes. Heat a non-stick skillet on high for 1 minute. Add 3 tablespoons oil and heat for 30 seconds. Reduce heat to medium. 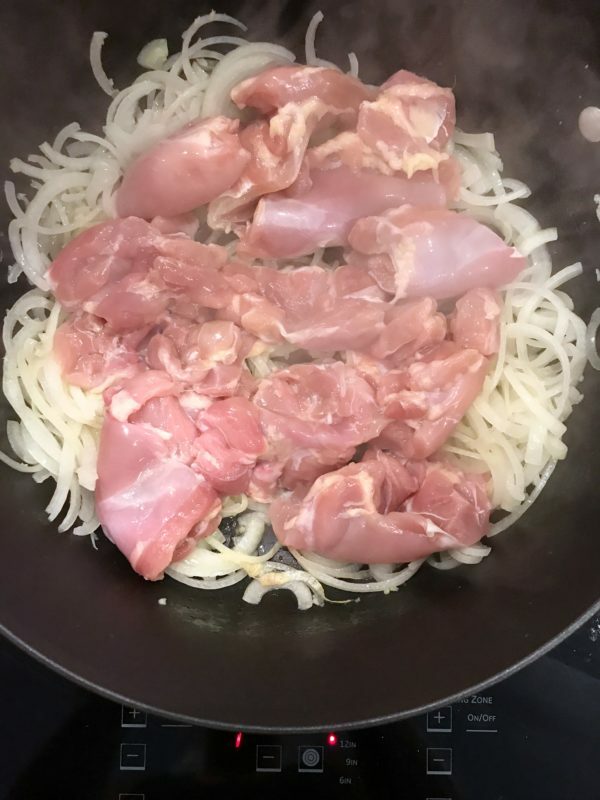 Add onions and garlic, sautéing for 3 minutes before adding chicken. Sauté 5 minutes or until chicken is lightly browned on both sides. 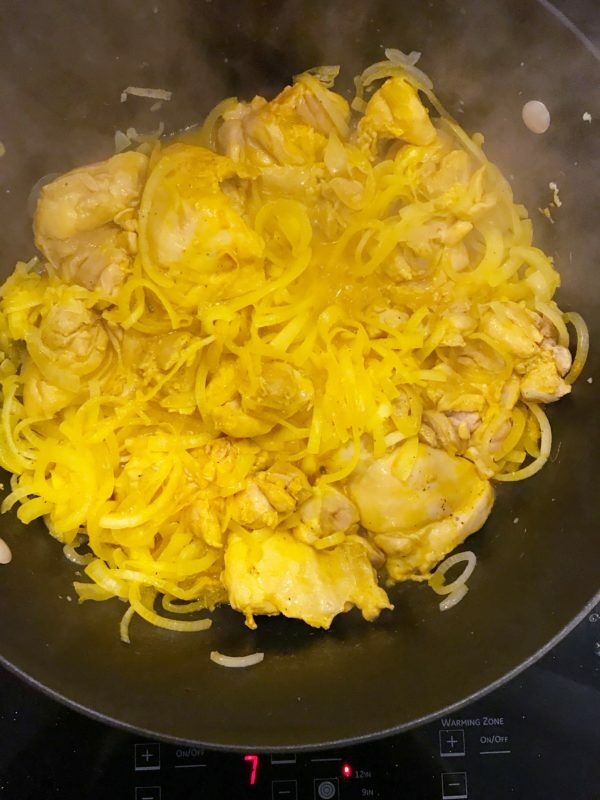 Sprinkle turmeric, saffron water, salt, and pepper over chicken. Stir to combine and sauté for 1 minute. Add 1 cup warm water, tomato sauce, lime juice, and dried lemon powder. Stir, cover, and simmer on low heat for 30 minutes. In a small bowl, beat egg whites until fluffy. Set aside. 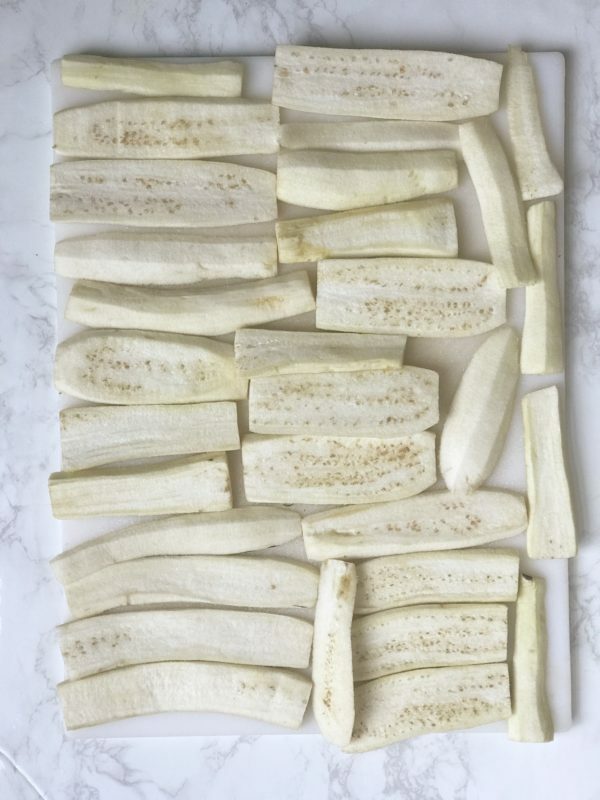 Rinse eggplant slices and pat dry. Heat a large skillet over high heat for 1 minute. Add 3 tablespoons oil, reduce heat to medium and heat oil for 30 seconds. In batches, brush eggplant with egg whites on both sides. Gently lay eggplant in the oil in a single layer. Brown eggplant on both sides until lightly golden brown. Remove from pan and set aside on paper towel. Add more oil as needed. Heat a medium sauté pan over high heat for 1 minute. Add 2 tablespoons oil, heating for 30 seconds. 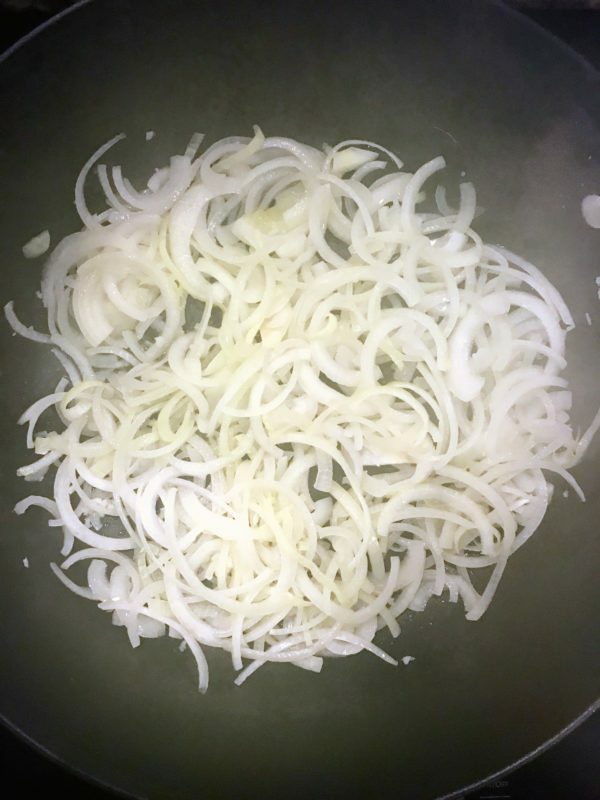 Add onions and sauté for 5 minutes or until lightly golden. Remove from heat and set aside. 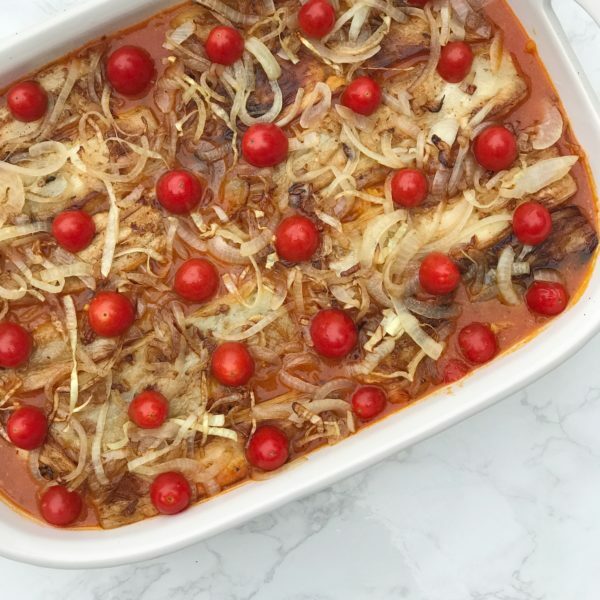 Transfer chicken and sauce to an ovenproof casserole. Arrange eggplant, onions and grape tomatoes on top. Cover with aluminum foil and bake for 30 minutes. Uncover and bake for an additional 10 minutes. Remove from oven and let sit for 15 minutes before serving. 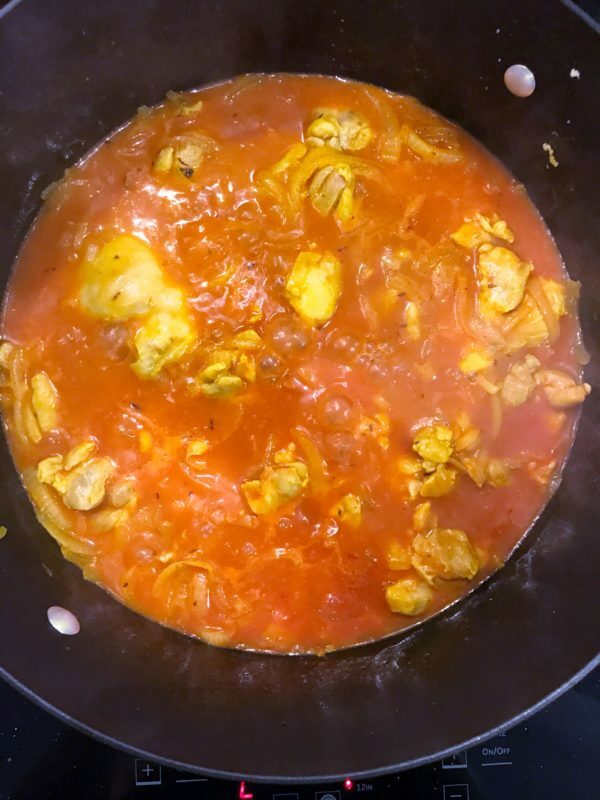 Serve over saffron basmati rice. 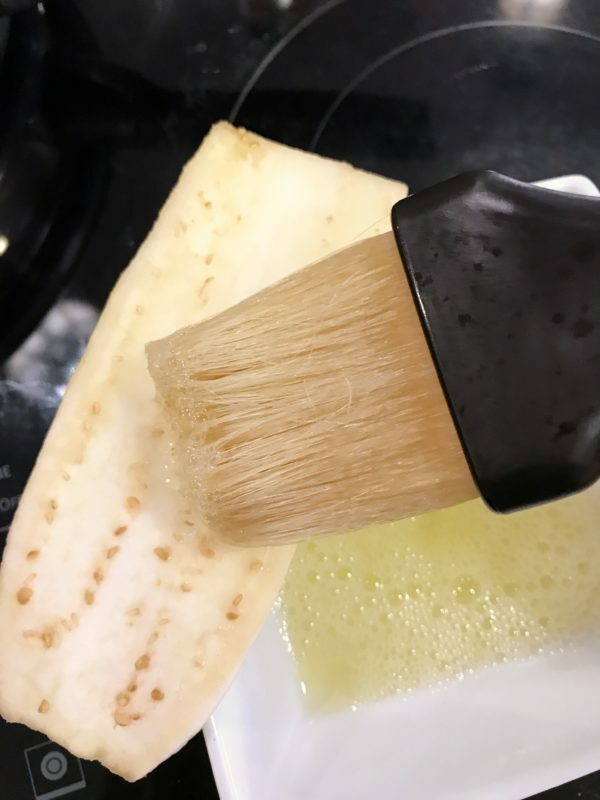 Brushing eggplant with egg whites prevents oil from soaking into eggplant while they are browned. You can substitute chicken for lamb if you prefer. You will use 2-3 Chinese eggplant, depending on the length of the vegetable. 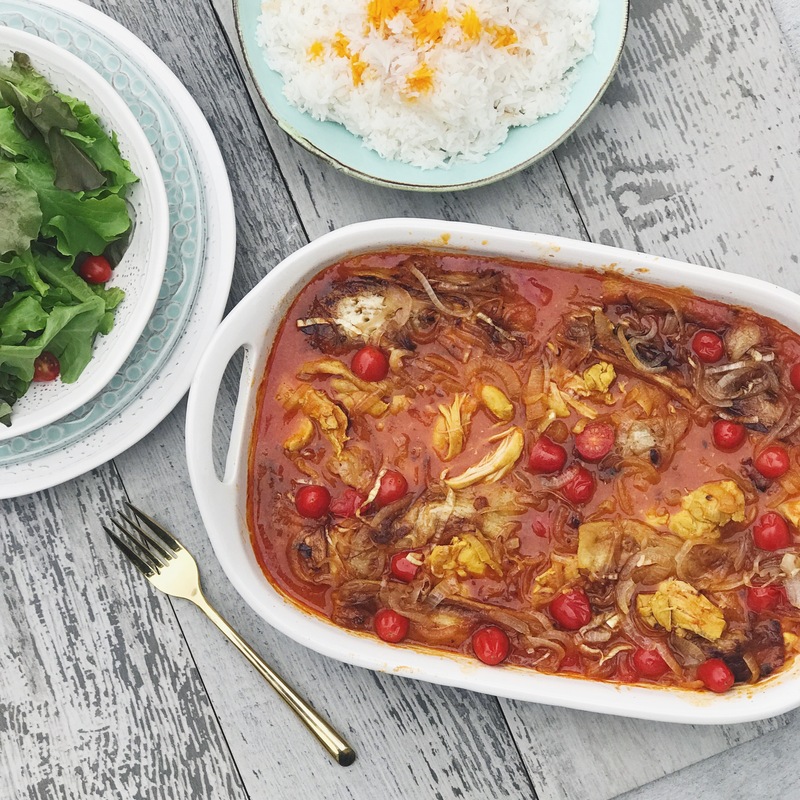 You can substitute regular eggplant if Chinese eggplant is not available or in season. You will only need 1 medium size eggplant. Thanks for the egg white tip. Thank you, Adele. I do love how well the egg white wash helps to prevent the eggplant from soaking up so much oil during the cooking process. I hope you enjoy the recipe!